After you graduate from AFF and jump a total of 25 times, you’ll be eligible to apply for the USPA’s skydiving A license. This, the first license you’ll hold as a new skydiver, proves that you’ve completed your training, learned about the equipment, mastered your emergency procedures, demonstrated that you can freefall safely and stably and have been professionally cleared to jump without supervision. 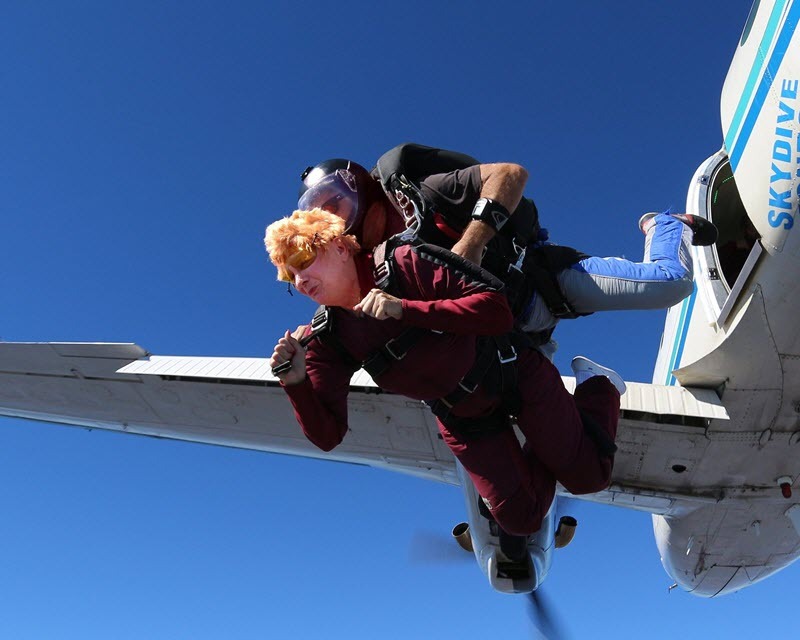 It’s super-exciting to get the license–and there’s even a fun and wacky skydiving tradition associated with it–so you can expect the day you pass that landmark to be an awesome day indeed. Once you’ve logged no less than fifty skydives, you’re eligible to apply for the USPA’s B license. As a B license skydiver, you will have proven that you rock an entry-level mastery in jumping both by yourself and with others in a group. Earning a B License requires proving that you can execute reasonably accurate landings, do some reasonably fancy turns and maneuvers in the sky, contribute to the planning and execution of group skydives and answer some tough questions on a written exam. Bonus: A USPA B license skydiver can start working toward helping others enter the sport. You can apply for a USPA skydiving coach rating, once you’ve completed 100 jumps! Now you’re kicking it up a notch. Your USPA C license allows you to do all of the things you can do as an A or B license-holder, plus start to work toward an actual skydiving instructor rating. To earn the license, you’ll have your work cut out for you: You’ll have to have completed 200 jumps (and proven that you’ve been in freefall for at least 60 minutes! ), have landed within just seven feet of a target on 25 jumps, have demonstrated some fancy freefall moves to a qualified instructor and have passed a written test. Here it is, folks: The highest license level you can earn from the USPA. You’ll only be eligible for it after you’ve logged a whopping five hundred jumps, which catalogs a wide range of proven skills and in-the-sky experience. The depth and breadth of knowledge accrued by a D-licensed jumper allow him or her to proceed to the highest-level ratings offered by the USPA: the demonstration jump rating and the tandem instructor rating, both of which carry a significant weight of responsibility. To put it simply: After AFF, the entire sky is waiting for you. Don’t disappoint it! Book your course today and let’s get you started working your way down the challenging road towards mastery.